The life expectancy of your toilet can vary depending on the amount of usage your toilet gets and how it’s taken care of. However, there comes a time when replacing your toilet is the best solution. How do you know when it’s time to replace your toilet? We’ve gathered a list of reasons it may be time to replace it. If your toilet resembles a janky one from a gas station restroom it may be time to replace the old throne. After years of usage a toilet can start to look a little shoddy. It can accumulate unsightly toilet rings and stains in the bowl that are impossible to remove no matter how hard you scrub it with a pumice stone. If you find yourself cleaning the toilet more and more and it’s unpleasant to look at, you may want to replace it with a brand new one. Another reason for replacement could be the outdated color of the toilet. 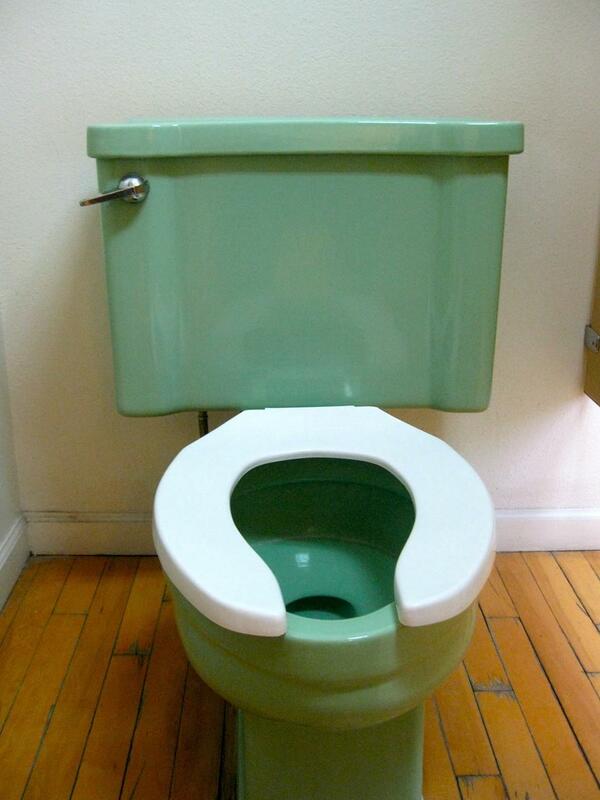 There were a lot of avocado and turquoise toilets installed back in the 1970’s. Not exactly a modern color scheme. A new toilet will be a lot cleaner, more hygienic, and help bring new life to your bathroom. The average person spends approximately ninety-two days on the toilet over a lifetime….for some dads it’s even longer! Comfort is important as well as personal when it comes to your toilet. If your legs are going numb when you’re on the commode the height of the seat and the width may not support you well. Make sure the toilet seat isn’t too small or too narrow and that the seat height isn’t too high or low. Standard sized toilets are 15 inches off the ground and so-called “comfort height” is 17 to 19 inches. Also, the cheapest toilet is usually the most uncomfortable; keep that in mind when you’re looking for the perfect toilet for your family. If you have an older toilet, just flushing it on a regular basis may have a negative impact on your utility bill. Before 1994 tank type toilets were flushed using anywhere between 3.5 to 8 gallons a flush. That’s a whole lotta water! Under federal guidelines enacted in 1994, modern efficient toilets are required to use no more than 1.6 gallons per flush which not only saves water but saves you money on your utility bill. A dual flush toilet is a variation of the flush toilet that uses two buttons to flush different levels of water and due to its ability to save water has become increasingly popular. If you’re having a plumber come out to your home to augur your toilet all the time, those visits are going to add up. Serious mineral buildup in the toilet not only creates an unsightly ring in the bowl, it can also disrupt normal flow of water into and out of the toilet tank. If your toilet is in constant need of repairs there comes a time when it’s more cost effective to replace it with a new model. Leaks from the toilet’s tank or bowl can go undetected for long periods of time, causing water damage to the flooring or subfloor. If allowed to continue, the entire floor may need to be replaced. Leaks can also cause damage to rooms below if the bathroom is upstairs. Leaks can also cause damage to rooms below if the bathroom is upstairs. Especially when dealing with older toilets, it may be more cost effective to replace a toilet than find and repair leaks. Leaks not only cause damage but also consume water, which will increase your utility bill. If you frequently see a puddle of water around your toilet, this could be more than a simple leak. You could have cracks in the tank…or somebody has really bad aim! Nothing lasts forever and as toilets age they are more vulnerable to cracks. You could have cracks in your tank and your toilet may need to be replaced. If the toilet appears to be working properly, flushing right, not clogged, not running, but there is water around the bottom of it, that could mean there are cracks in the tank or bowl. If you’re looking to repair or replace your toilet, call Bonney Plumbing at 800-444-0551. We’ll have a 5-star premier plumber give you options for repair and replacement for you and your family.